The Southern Rhône is a magical place. On a sweeping tumble of broad terraces beneath villages of ancient glory lie sun-drenched vineyards filled with the scents of thyme and lavender. To drink a good bottle of Côtes-du-Rhône is to drink the warmth of southern France. Young Maxime-François Laurent’s star is on the rise. He grew up at the esteemed Domaine Gramenon watching his talented father Philippe produce edgy wines until his tragic death in 1999. 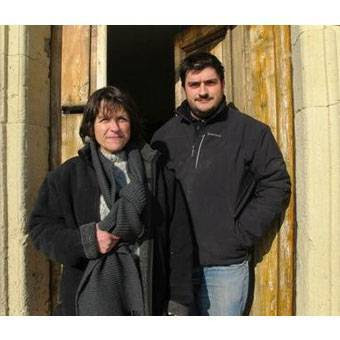 His mother, Michèle, stepped in to the role of vigneron and has brought the wines of Domaine Gramenon to near cult status. After schooling and winemaking experience in Burgundy, Maxime-François returned home to work beside his mother and begin bottling cuvées at the domaine under his own name where he captures the essence of the microclimate of the northeastern village of Montbrison-sur-Lez. The Laurents do not merely champion biodynamic farming, they incorporate the concept of sustainability into their daily lives by growing their own food and raising their own animals. Their approach to winemaking is similar. The harvest is hand-picked and sorted to ensure only the best fruit is selected. The cellar is gravity-fed for minimal handling of the juice. The wines are typically aged in neutral oak demi-muids and foudres. All fermentations are natural, using only indigenous yeasts, and sulfur additions are daringly minimal. Cuvée “Il Fait Soif” is a blend of 80% Grenache and 20% Syrah from 15-30 year old vines growing out of clay and limestone soils. The Syrah ferments with carbonic maceration for fruity freshness while the Grenache sees partial whole cluster fermentation to add vibrancy, purity, and complexity. The wine then ages for six months in stainless steel cuves. The result is a wine that is quaffable (il fait soif means it’s drinking time) and genuine, with intense aromatics of violets, rain-soaked earth, cherry cordial, baked clay, and dried herbs. This is a fantastic wine to stock up for the holiday season, it will perform as a cocktail wine just as well as it will pairing with roast leg of lamb, and everything in-between. To be sure, your guests will be toasting your good taste in wine. Our regular customers might remember the 2014 vintage of Maxime-François Laurent’s cuvée “Pourpre” that we brought in a couple years ago. It was a popular wine while it lasted. The 2016 version has had its name changed to “La Rubiconde” but the wine is still the essence of Grenache from 50 to 80-year-old vines fermented in cement tank and then aged in neutral oak barriques and demi-muids. It is a wine of ripe, dense fruit that avoids being overblown or jammy. A blend of 70% Grenache (60-year-old vines) and 30% Syrah (35-year-old vines) fermented in steel tank and then aged in neutral oak barriques and demi-muids. “Orpiment” has much of the ripe fruit of “La Rubiconde” with the added dimension of Syrah to add darker fruit flavor and smoky aromatics.